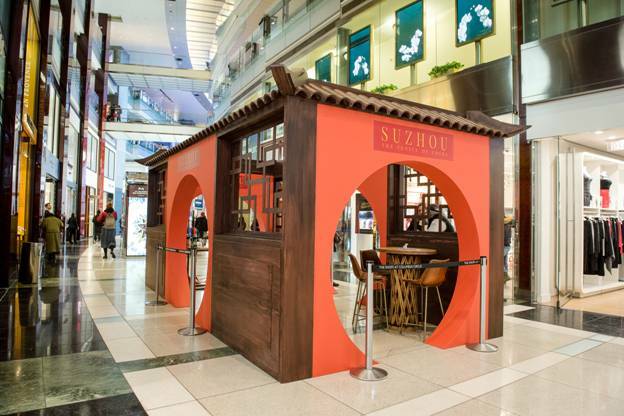 In celebration of International Tea Day on December 15, Suzhou Tourism created an interactive holiday teahouse pop-up from Thursday, December 14 to Saturday, December 16 at The Shops at Columbus Circle in New York City. Inside the Suzhou-style teahouse, tea experts from Tea Drunk, a New York City-based purveyor of some of the world’s most prized tea, served the destination’s famed Biluochun green tea to media, influencers, key opinion leaders, travel agents, tour operators, and consumers. Upon entering one of the teahouse’s four moon gate entrances, guests were encouraged to sit at one of the tables to experience a traditional tea tasting and learn more about Suzhou’s many attractions including its UNESCO World Heritage gardens, historic water towns, museums, factories dedicated to the production of silk, and more. During the three-day event, the teahouse became a peaceful sanctuary, similar to that of a real teahouse in Suzhou, where shoppers were invited to rest during the busy holiday season. Historically, Suzhou has been synonymous with high culture and elegance, including a prominent teahouse culture that is the most popular leisure activity amongst the locals. Biluochun, one of the 10 famous teas of China, is indigenous to Suzhou as it is only produced along the Dongting mountain region. Due to its rarity, the people of Suzhou take enormous pride in their local emerald-green, spiral-shaped tea. In addition to the complimentary tea served daily, Suzhou Tourism representatives were on hand to educate guests on the popular Chinese city dubbed “The Venice of China” due to its picturesque canals and waterways. While enjoying their relaxing time in the teahouse, guests were encouraged to take photos to post on social media, tagging #VisitSuzhou for the chance to win a special silk robe designed in Suzhou. For an inside look at the Suzhou Tourism holiday teahouse, visit the destination’s official Instagram, Facebook, and Twitter channels (@VisitSuzhou) or follow the official hashtags #TravelSuzhou and #MadeInSuzhou. Suzhou, the “Venice of China,” is known for its elegant stone bridges, canals, flowing water, and noteworthy architecture. Located in the center of the Yangtze River Delta, approximately 60 miles west of Shanghai, Suzhou is one of the oldest cities in the Yangtze Basin dating back more than 2,500 years. The city boasts the beautifully manicured Classical Gardens of Suzhou, nine of which have been designated a UNESCO World Heritage Site, as well as 11 destinations along the Grand Canal that have also been designated world cultural heritage sites. For more information on Suzhou, please visit www.TravelToSuzhou.com. Be the first to comment on "Suzhou Tourism Celebrates International Tea Day With Holiday Teahouse at The Shops at Columbus Circle in New York City"